The Quaker Company has changed the recipe for their Vanishing Oatmeal cookies. They’ve reduced the butter and the white sugar. I’m posting the original here because the extra butter definitely improves the final product. 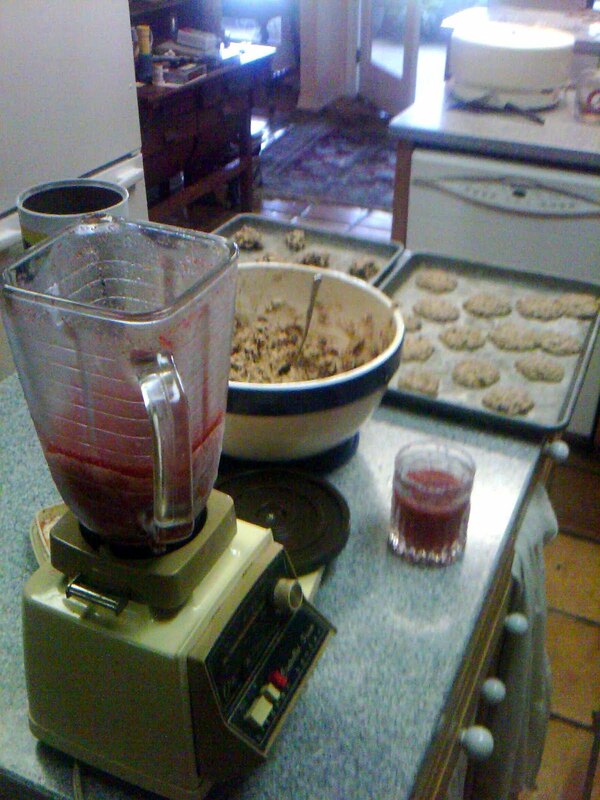 As I was on a strawberry kick, I made margarita’s while baking the cookies and they tasted pretty good together. Beat together butter and sugars until creamy. Add eggs and vanilla and beat well. Combine flour, baking soda, cinnamon and salt, mix into butter mixture. Stir in oats and raisins, mix well. Drop by tablespoons onto ungreased cookie sheet. Bake 10 minutes or until golden brown. Cool 1 minute on cookie sheet, remove to wire rack. Combine in a blender, ice, strawberry water, tequila, lime juice, Triple Sec and simple syrup. Puree until smooth. Pour into rocks glasses that you’ve sugared the rim and serve.